This is a very unusual Christmas card (and I have three of them listed separately in my store). It is genuine copper, with a cool, slick metal feel. It is a wonderful 1920's - 1930's vintage art deco design of a mission church bell. Really beautiful - and really unique! I bought this card as part of a big box lot of ephemera from a Texas estate. 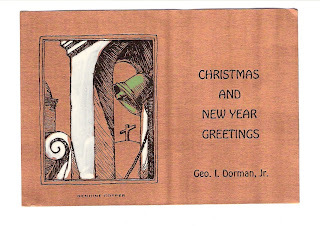 I have many more vintage cards (Christmas, Valentine's, Easter, and more) to list in the next month or so.